The Ashanti Regional Missionary of the Ahmadiyya Muslims Mission, Maulvi Abdul Hamid Tahir, has reminded Muslims that each of them has a right to join any political party of his or her choice or vote for anybody aspiring for a political office in the country. However, they have a religious obligation to refrain from any act of violence or tendency capable of creating anarchy in the society. Maulvi Tahir again reminded the Muslims, particularly the Ahmadis of their responsibility to always intercede spiritually for the prosperity and peace of their homeland while submitting to the political, religious and local leaders. Maulvi Tahir was preaching at a Congregational prayer session of Ahmadi faithful at the T. I. Ahmadiyya Senior High School Park in Kumasi to commemorate this year’s Eid ul-Adha or festival of Sacrifice. Maulvi Tahir told the congregation that he, as a Pakistani, has chosen Ghana as his second home saying that Ghana is the most peaceful country in Africa for which reason the people must be proud and do everything within their ability to sustain it. According to him, people of many other nations including Syria, Pakistan, India and Egypt are in turmoil currently but wished they had the peace of Ghana. tools for the creation of chaos in the society, politicians and political parties must also preach as well as live in peace. 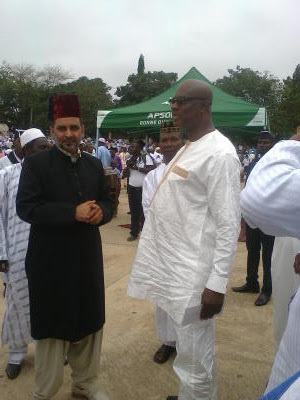 The Kumasi Metropolitan Chief Executive, Kojo Bonsu who graced the congregational prayers with members of the Regional Security Council and the Ashanti Regional Chairman of the ruling NDC, Yaw Obimpeh, asked adherents of the Islamic faith not to allow anything to stand between them and their total submission, faith and respect for Allah. Mr. Kojo Bonsu said government is doing its best to improve access and the quality of Ghana’s formal education hence the introduction of various interventions such the progressively free senior high school. Parents and guardians must also play their part to ensure that their children, especially the girl-child take advantage to acquire higher education for their personal and social development. The Kumasi Metropolitan Assembly donated a ram, 10 bags of rice and five gallons of cooking oil to the Ashanti Regional Mission of Ahmadiyya to assist the needy among them to also enjoy the occasion.